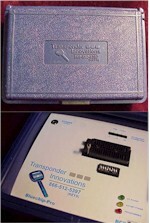 The BLUECHIP-PRO, originally sold by Transponder Innovations, was marketed as an immobilizer reflash package for Toyota, Lexus and Honda vehicles. Many locksmiths purchased the package and continue to use it to reflash immobilizers. Some locksmiths who purchased the package were not successful or experienced inconsistent results when using the product. If you own a BLUECHIP-PRO and would like to use the product, not only for immobilizer reflashing, but also for EEPROM work and ECU applications, Andromeda Research offers two an upgrade packages just for your unit. Upgrade package #1 includes the most recent adapters and connection options which allow you to work with EEPROMs. Upgrade package #2 includes adapters and connections options which allow you to work with both EEPROMS and Microcontrollers. With an upgraded BLUECHIP-PRO package you may also wish to consider additional options. This Bluechip-Pro upgrade includes the items necessary, when added to your existing unit, to create a complete locksmith EEPROM package. The package includes the latest software, the In-Circuit EEPROM adapter (#ASERSM1A), the surface mount chip clip (#ASOIC8), the surface mount probe set (#SMP8), the surface mount clamshell adapter (#ASOIC8S) and the hands-on tutorial with locksmith librarian applications. This Bluechip-Pro upgrade includes the items necessary, when added to your existing unit, to create a complete locksmith EEPROM and Microcontroller package. The package includes the latest software, the In-Circuit EEPROM adapter (#ASERSM1A), the microcontroller adapter (#ACOM2), the surface mount chip clip (#ASOIC8), the surface mount probe set (#SMP8), the surface mount clamshell adapter (#ASOIC8S) and the hands-on tutorial with locksmith librarian applications. The CBL12DC allows the AR-32A programming unit to be powered from a standard 12 VOLT DC vehicle accessory connector. The cable includes a fused plug assembly with replacable fuse which is inserted into the vehicle for power. The opposite cable end is terminated with the standard AR-32A compatible plug.